We all have our weaknesses when it comes to food, what’s yours? For someone who loves food, it’s truly hard to pick just one. Sushi, ice cream, Nutella sandwiches…basically most foods are weaknesses. But among all of my favorite foods to eat, there’s one that has made it to the top of the list. Freshly baked goods. Warm cobbler, gooey chocolate chip cookies, and don’t even get me started on bread. The smell of freshly baked bread should be an air freshener scent. Really. You have total control! You know exactly what is going into your food. You decide on the type and amount of sugar, fat, and flour used the baked product. Most mixes contain partially hydrogenated oil (yes, that’s trans fat! ), food coloring, and preservatives. While baked goods are often seen as diet splurges, you can still satisfy your cravings while still incorporating healthy fat, vitamins, minerals, fiber, and protein. 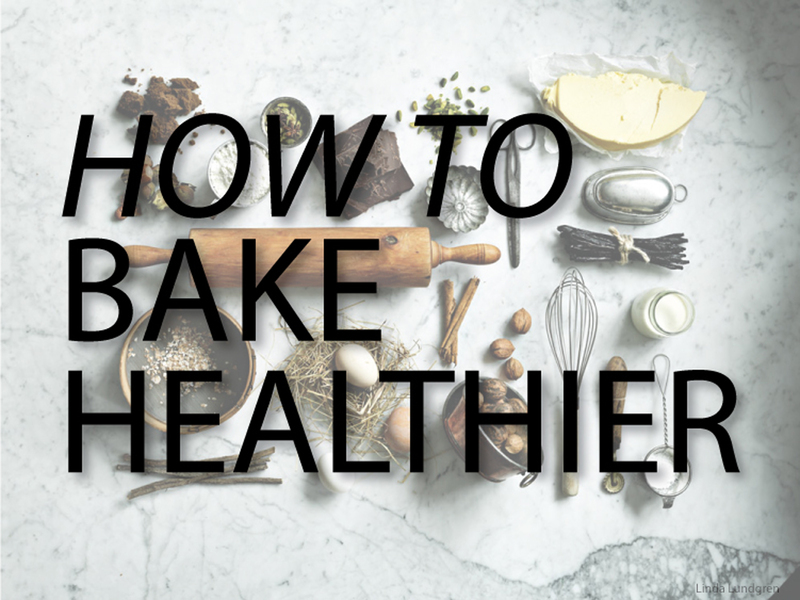 Here are some tips to modify any baking recipe to make it more nutritious! These tips can also be applied to baking mixes. Sugar plays an important role in baking because it contributes to moistness, browning, and sweetness. Alternative sweeteners? Some sweeteners are advertised as being healthy because they are “all natural”. For example, Agave syrup is from blue Agave plants native to Mexico, South America, and part of the United States. The syrup you see sold in stores is a processed product made from the natural sweet liquid that comes from the plant. Little evidence shows that Agave syrup is significantly healthier than sugar. When it comes to sweeteners the bottom line is to focus on the amount that is added rather than the type of sweetener. Use spices and extracts such as vanilla, nutmeg, cinnamon, etc. Typically white flour is used in baking but unfortunately much of its nutrients are stripped away during processing. The US Dietary Guidelines recommends half of the grains we consume each day to be whole grains and what better way to incorporate that than with baked goods! Instead of opting for the usual white flour, experiment with new flours by visiting the bin aisle of your local health foods store. If the recipe calls for 2 or more cups of flour you can substitute ¼ or ½ cup of it with flaxseed meal. Flaxseeds are high in omega-3 fatty acids, fiber, and lignans, which have anti-cancer and anti-inflammatory properties. Lastly, add nutrient dense foods, such as fruits and vegetables, to baked goods as a subtle way to increase the nutrition profile. Try these black bean brownies to satisfy your chocolate craving while consuming fiber-rich black beans! Ask a Dietitian! We are compiling a list of nutrition-related questions readers have for a special post in September. Simply fill out your name, email, and question in the feedback form below.